Two hundred and twenty-fourth pope; born at Florence Dec. 11, 1475; elected March 11, 1513; died Dec. 1, 1521. His pontificate was very favorable for the Jews in general and for the Jews of Rome in particular. The latter saw in the kind treatment they received at his hands a sign of the arrival of the Messiah; and so much impressed were they with this idea that the leaders of the Roman community asked those of Jerusalem if such signs were not visible in the Holy Land. 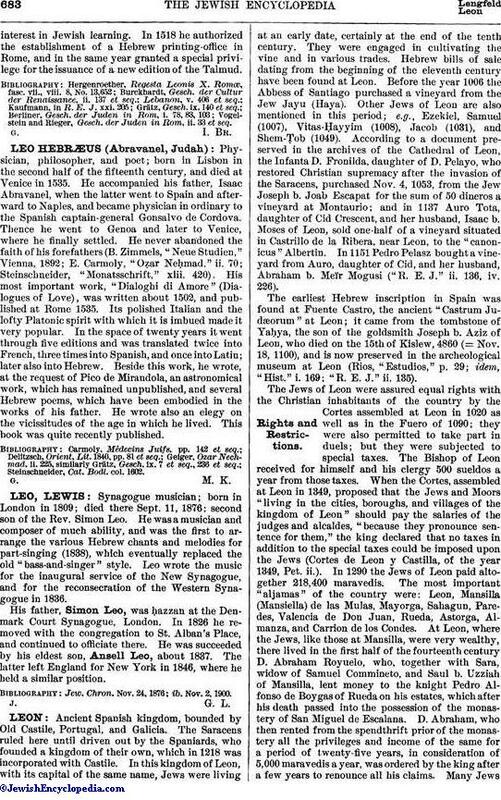 While still a cardinal, Leo showed his spirit of toleration in bestowing his favor upon two Jewish musicians, Joan Maria and Jacopo Sansecondo, especially upon the former, who subsequently received from him the title of count. 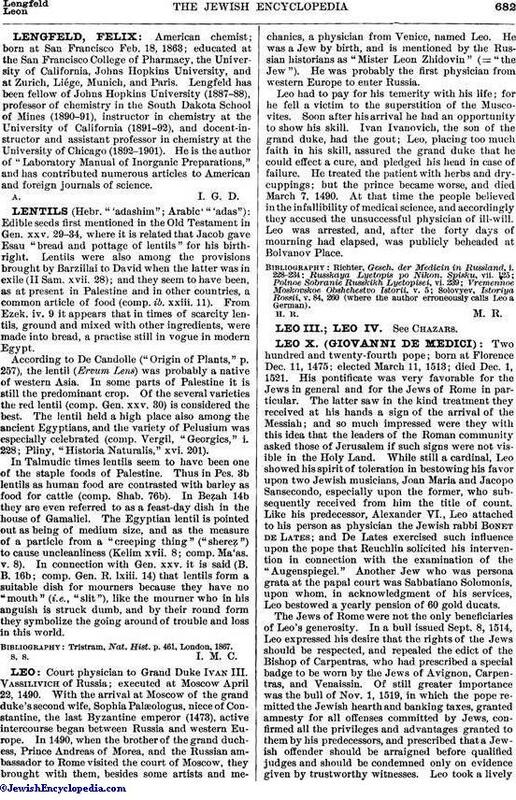 Like his predecessor, Alexander VI., Leo attached to his person as physician the Jewish rabbi Bonet de Lates; and De Lates exercised such influence upon the pope that Reuchlin solicited his intervention in connection with the examination of the "Augenspiegel." Another Jew who was persona grata at the papal court was Sabbatiano Solomonis, upon whom, in acknowledgment of his services, Leo bestowed a yearly pension of 60 gold ducats. The Jews of Rome were not the only beneficiaries of Leo's generosity. In a bull issued Sept. 8, 1514, Leo expressed his desire that the rights of the Jews should be respected, and repealed the edict of the Bishop of Carpentras, who had prescribed a special badge to be worn by the Jews of Avignon, Carpentras, and Venaissin. Of still greater importance was the bull of Nov. 1, 1519, in which the pope remitted the Jewish hearth and banking taxes, granted amnesty for all offenses committed by Jews, confirmed all the privileges and advantages granted to them by his predecessors, and prescribed that a Jewish offender should be arraigned before qualified judges and should be condemned only on evidence given by trustworthy witnesses. Leo took a livelyinterest in Jewish learning. In 1518 he authorized the establishment of a Hebrew printing-office in Rome, and in the same year granted a special privilege for the issuance of a new edition of the Talmud. Vogelstein and Rieger, Gesch. der Juden in Rom, ii. 33 et seq.